"A perfect blend of unique flavors comes together to make this amazing apple pie. 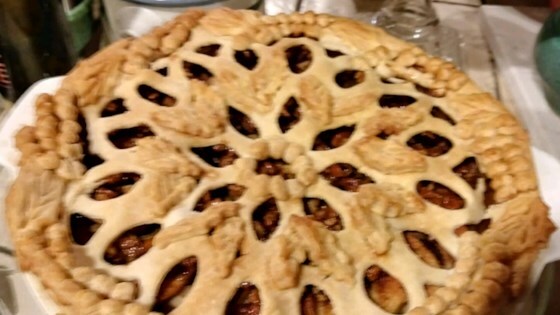 I just came up with it one day when I couldn't find an apple pie recipe that was appealing." Preheat an oven to 350 degrees F (175 degrees C). Stir together the sugar, cinnamon, and nutmeg in a small bowl; set aside. Press one of the pastries into the bottom of a 9-inch pie pan; reserve the crust. Toss the apples with maple syrup and vanilla extract. Spread 1/3 of the apples into the pie pan and sprinkle with the sugar mixture. Repeat the layers with the remaining apples and sugar. Cover the pie with the top crust and pinch the edges to seal. Bake in the preheated oven until the crust is golden brown, 30 to 35 minutes. Allow to cool before serving. I didn't find this to be sweet enough, would probably add a bit more maple syrup next time. My pie was great. Thanks for the recipe. I would pass this on to friends. it was good, but lacked that traditional feel i was looking for. On its own merits its a great pie though! !